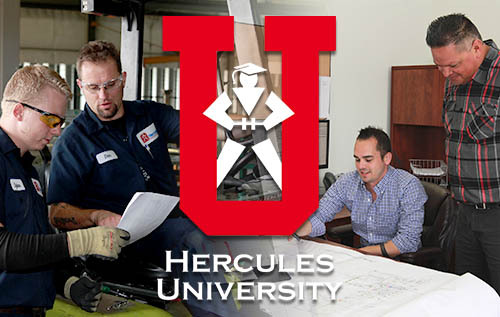 Hercules University is an online portal that connects Hercules employees to educational resources in the HVAC wholesale/distribution industry for career planning, implementation, tracking and advancement. All Herculeans are encouraged to participate in Hercules University courses. Hercules Universities was designed to help you develop the knowledge and skills that are necessary for you to have the best success in your department. Resources are available or being developed for all of our departments. As we work together to be better at what we do, these tools provide education in the Heating and Air Conditioning wholesale and distribution business. Where I sit tomorrow, depends on the steps I take today... We value our employees, and this in house training is designed and developed for you to grow and advance in areas to enhance your journey of success! My success or lack of, is dependent on me... Taking the time to learn new skills has a great payoff in the advancement in your career. Learn for a new position, or brush up on safety or product knowledge. Hercules University provides each Herculean the opportunity to direct their intellectual and professional growth. True to Hercules Mission statment, HercU's focus is on this part "...our employees grow financially, intellectually, emotionally and spiritually." Thanks for being a part of our team, and growing with Hercules Industries. Copyright © 2019. Hercules University.